Legends and folklore, mysteries and myths, science and speculation can’t completely explain the ancient encrypted carvings on large boulders located at the Track Rock Archeological Area. The Track Rock Gap Archeological Area is in the heart of North Georgia’s Chattahoochee National Forest just below Brasstown Bald along County’s western border. This archeological site lies in a low gap between two mountain ranges and is easily accessed by a paved roadway that travels along right next to the archeological site. Trackrock Road, which passes over the gap next to the site, is part of an ancient trade route that traveled from north to south through the mountains. This site and trade route is estimated to have been in use since 1,000 A.D.; some speculate that the site and trade route are several thousands years older. There are six major boulders at the site covered in encrypted carvings along with several other smaller stones scattered about the site that appear to have some type of carvings. These primitive carvings depict ancient symbols of human and animal forms along with what might be described as spirit beings. These carving were created at different times and not all at once, each set of carvings appears to tell a story or possibly a type of ritual. Whatever the mysteries at Track Rock Archeological Area are, is all up to speculation since the stones speak a language that archeologists as well as the native Cherokee haven’t been able decipher as of yet. Symbols may coincide with native legends yet their meanings are too uncertain. The Blue Ridge Highlander believes each visitor to the site can decide for themselves as to their nature and purpose. 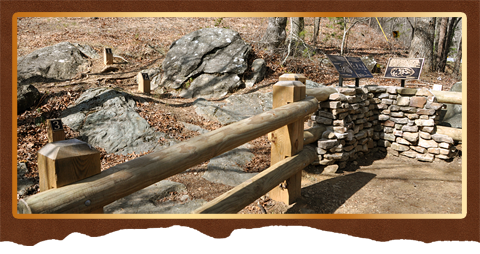 What’s been newly added to the site is and interpretive area alongside the main boulders. What’s been removed from the site are the old protective grated cages that covered some of the larger boulders often obstructing the carvings though providing adequate protection from earlier vandalism and thief. A feature story by the Blue Ridge Highlander concerning this site will find its way to its online magazine in the near future. This tale and other ancient tales of these regional mountains have many twist and turns to travel before attempting to unlock the mystery of the talking rocks and the spirit people the legends tell about.